Both Fetch and Freight have an internal computer which runs a Long Term Support (LTS) release of Ubuntu and an LTS release of ROS. These releases are intended to give long-term stability to the system. The robot has both internal and external Ethernet-based networks, as well as an external wireless network interface. The external network interfaces are intended for users to connect to the robot, while the internal networks are used to send data between the internal components of the robot. The majority of communication between components onboard Fetch and Freight happen via the internal Ethernet network. This network is located in the 10.42.42.0/24 subnet and connects the robot computer to the devices listed in the table below. As such, it is important that your building networks do not use the same subnet. There are two possible interfaces for external connecting to the robot computer: the wireless interface and the wired interface. Most users will prefer to use the wireless interface, however the access panel also includes a Gigabit Ethernet interface for stationary tasks that require higher bandwidth. Never drive the robot with an Ethernet cable attached to the access panel. The easiest way to configure the wireless networking is to connect a monitor, keyboard, and mouse and use Ubuntu’s Network Manager interface. After making changes, restarting the robot will ensure changes for the ethernet port take effect. External networking with the robot is typically done to provide an interface to various ROS capabilities. To ensure a working network setup between robot and PC, reference the following guide to the ROS_MASTER_URI and ROS_HOSTNAME environment variables. A key recommendation is to use hostnames instead of IP addresses for ROS_MASTER_URI and ROS_HOSTNAME. This will minimize issues with e.g. DHCP not being present or unexpectedly changing network behavior. A symptom of an incomplete setup may be that some ROS commands work, while others do not. 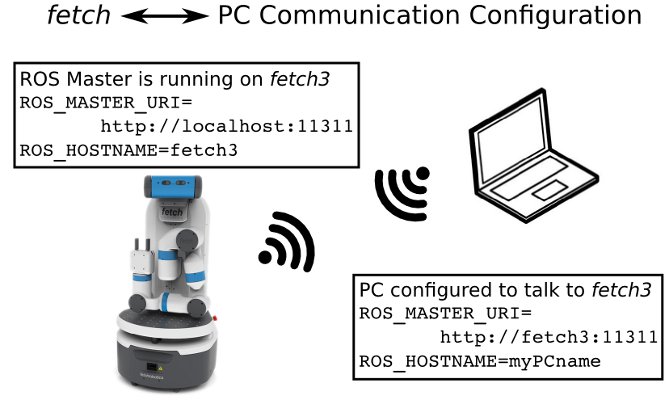 Commands (such as rostopic list, rosservice list) retrieve information through the connection they create, while other commands (rostopic echo, many components in rviz) attempt to tell the robot a location to send info to via future connections. For a more in-depth general overview of robot-to-PC networking, see also the ROS Network Setup Tutorial. Since the roscore runs independently of the drivers, the drivers can be restarted without having to restart remote instances of RVIZ or similar ROS tools. Note that this also means the parameter server will not be reset when restarting the drivers, and so a roscore restart may be required if the parameter server has been corrupted by a user script. A number of log files are created on the robot. Log files related to upstart services can be found in the /var/log/upstart folder, the name of the log will be service.log. ROS logs for the robot and roscore upstart services will be created in the /var/log/ros folder. The mainboard of Fetch and Freight contains a USB audio device. While the device enumerates as a standard Linux audio device, we recommend using the sound_play ROS package to access the speakers. sound_play is automatically started as an upstart service when the robot starts. This service is pre-configured to have the correct group-level access to the audio system. If using the speakers directly through a Linux interface, be sure to add your user to the audio group in order to actually access the speakers. >$ sudo su ros -c "alsamixer -c 1"